I am not one to make quick decisions. I never have been. My paralizing inability to make snap judgements is a periodic subject of (loving) mockery amongst those who know me best. When going out to dinner, I might be inclined to sneak a glance at menu in advance, just to be well-versed in my options. (But then, my best-laid plans are frequently set aside as soon as the specials are announced). Suffice it to say, I am a planner, a ponderer. A girl who likes to know her options. But in regards to certain things, special things, passion overrules reason and I have my answer ready before you've finished the question. Unsurprisingly, considering my fixation with breads, bagels are one of those things. In my mind there is but one city that can claim the crown of bagel-making supremacy, and that is Montreal, Quebec, Canada. Full stop. No equivocation. Not a moment's hesitation. Montreal is home to the best bagels around. There, I said it. Bring it on New York. I'm ready for you, Toronto. As far as I am concerned, Montreal's bagels are a thing unto themselves, a whole other (perfect) incarnation of bagel. And although I hasten to mention I've not had many bagels overseas, I'm nonetheless willing to cross my heart and raise my right hand to pledge my allegiance to those from the town where I was born. And no, I will not admit a trace of bias there. I cannot overstate the lure of a freshly-baked bagel from one of the many storied shops in Montreal. To truly understand their greatness, I implore you, get thyself to la belle province as soon as possible and experience them firsthand. You'll thank me later. In the off chance that you are not willing to take me at my word, let me count the ways that Montreal's bagels are the so divine. They inspire devotion. Example; I used to know someone whose job would take him from Toronto to Montreal on a fairly-regular basis. On those glorious days when he would return, those waiting for his arrival would set upon him almost immediately, hungry for their fix. Setting upon the nondescript brown bags he held in his clenched fists, they would tear them open, their contents would spill across out, sesame seeds scattering everywhere. I was one of those people. Sometimes I would stash an extra bagel in my purse to take home. I'm not proud of that fact, but it is true. The inspire gluttony. Even though nobody, save myself, was "much in the mood for bagels" when I set about baking, our batch of 24 was gone in 48 hours. You see, Montreal bagels are not the billowing cotton-ball, bite-down-on-a-pillow, overgrown mass of tasteless fluff that so many bagels are these days. 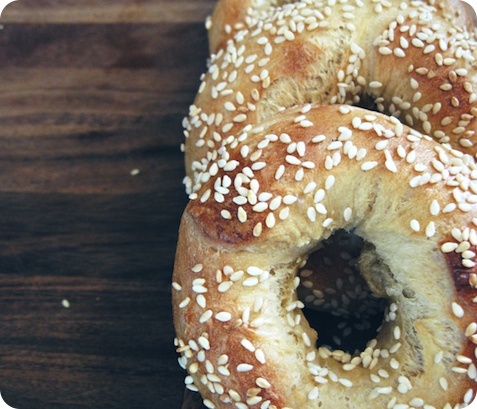 These bagels are ropey and irregular in their looks, skinny limbed and gorgeously misshapen. Before baking, the bagels are dipped in a honey-laced bath, the sweetness reinforcing the trace of malt syrup in the dough. They are studded with seeds, sesame or poppy, before being torched in requisite wood-fired ovens. Those seeds get scorched in spots, turning gold and brown, their nuttiness brought forth by the flames full throttle. The interiors are tightly crumbed, dense and chewy. There is no mistaking a these for a glorified roll. Now which bagel shop in Montreal gets my heart? Don't get me started. While I do not have a wood-fired oven at home, these bagels are a close approximation of those from Montréal. From HomeBaking: The Artful Mix of Flour and Tradition Around the World by Jeffrey Alford and Naomi Duguid (Random House Canada, 2003). The ingredient list below is theirs, while the method is my interpretation of their instruction. As the boiling and baking of bagels is a bit of a procedure, it is best to have all equipment at hand . When ready to begin, have a slotted spoon and baking peel (or a baking sheet to use as a peel) at the ready. Put the sesame seeds or poppy seeds on a large, shallow dish, and have a cooling rack nearby. In a medium bowl, or the bowl of a stand mixer with the dough hook attached, dissolve the sugar in the lukewarm water. Stir in the yeast. In a small bowl, dissolve the wheat malt syrup into the 1/2 cup warm water. Stir in the egg, oil, and salt. Set aside. If proceeding by hand, add 1 cup of the flour to the yeast mixture and stir to combine. Add the wheat malt mixture and then 2 more cups of flour and stir, always in the same direction, until a smooth dough forms. It will be quite moist. Add the remaining 1 cup of flour and stir to incorporate. The dough will be quite stiff. Turn the dough out onto a lightly-floured work surface and knead for 5-10 minutes, until it becomes smooth and elastic. If using a stand mixer, add 2 cups of flour to the yeast mixture and mix on low speed for about 1 minute. Add the wheat malt mixture and the remaining 2 cups of flour, and stir on the lowest speed for 3 to 4 minutes. Turn out onto a lightly-floured work surface and knead briefly, until the dough is smooth and elastic. Place the dough in a clean medium bowl and cover with plastic wrap. Let rise for 1 3/4 to 2 hours, until the dough has doubled in volume and is soft. Punch down the dough gently, recover and let rise for another 1 to 1 1/2 hours. If you have one, place a baking stone or unglazed quarry tile (see note) on a rack in the upper third of the oven. Preheat oven to 450°F (230°C). Cut the dough into quarters, working with one piece at a time and covering the remaining in plastic wrap. Divide the piece of dough into 6 equal pieces (weighing approximately 2 ounces each). Roll each small piece out into a skinny rope, around 10 to 12 inches long. Press down on the rope, rolling it back and forth under your palms against the work surface, pushing out and gently towards the ends. The dough is very elastic, shrinking back if overworked. It is easiest to work two ropes at a time, alternating between the two and allow each to rest in between. When the rope is to the appropriate length, lay the dough over one hand, with one end across your palm and the other hanging free. Bring this second end across the back of your hand to form a loop, and bring the two ends together, overlapping by about an inch. Pinch the ends together, then bring them down under your hand against the work surface, rolling them together gently. Place bagel on a parchment-lined baking sheet and repeat the process with the remaining 5 pieces of dough. Cover with a cotton cloth and let stand for 15 minutes. Meanwhile, bring 8 cups of water to a gentle boil in a wide 4-to-6-quart pot. Add the honey and stir to dissolve. Gently slide 3 bagels into the boiling water; they may sink for a moment, but should break the surface within 10 seconds. Use the back of the slotted spoon to gently press the bagels back under the water now and again, letting them boil for a total of 45 seconds. The should be slightly puffed. Remove the bagels using the slotted spoon and move them directly to the sesame or poppy seeds. Roll and press the bagels into the seeds, coating well, then place them on your baking peel or a parchment-lined baking sheet, leaving about an inch between them. Repeat the process with the remaining 3, placing them beside the first 3. Bake for about 8 minutes on the baking stone or parchment-lined baking sheet, then use a long-handled spatula to turn them over and bake for another 5 to 7 minutes, until golden brown. As soon as you put the bagels in to bake, start shaping the next batch of 6. Remove the baked bagels from the oven to a cooling rack, allow the stone to recover for a couple of minutes, then bake the second batch. Repeat until all of the bagels have been shaped, boiled and baked. Makes 24. Best eaten the day they are made, or can be split and frozen in a well-sealed freezer bag. • I do deviate from Alford and Duguid's direction regarding size, upsizing their bagels slightly from (when raw) 1 1/2 ounces to 2 full ounces. To follow their lead, cut the quarters of dough into 8 pieces instead of 6, resulting in 32 finished bagels. • For those who do not have a baking stone, I remembered a tip from ages ago regarding the use of cast iron pans for pizzas. I tried the method, using my basic 10-inch skillet, to particularly fine results. Michael Ruhlman suggests inverting the pan, but I didn't. A flat top cast-iron griddle would be ideal. • Wheat malt syrup is a grain product used in bread dough to assist in rising and to develop a deeper, more complex taste. Wheat malt syrup is available at specialty and natural food stores. 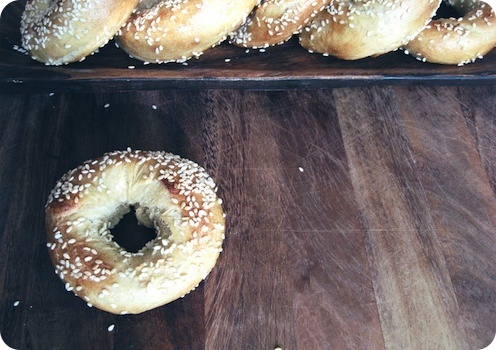 • A thorough discussion of Montreal's bagels can be found at Tasting Menu.